Marianne Boesky’s Upper East Side gallery is currently presenting the exhibition “let’s get dizzy”, featuring new work by Yuichi Higashionna. This Tokyo artist’s work is a reaction to Japanese Art and design of the 1970’s and questions the connection between luxury and aesthetics. His use of abstraction incorporates geometry. 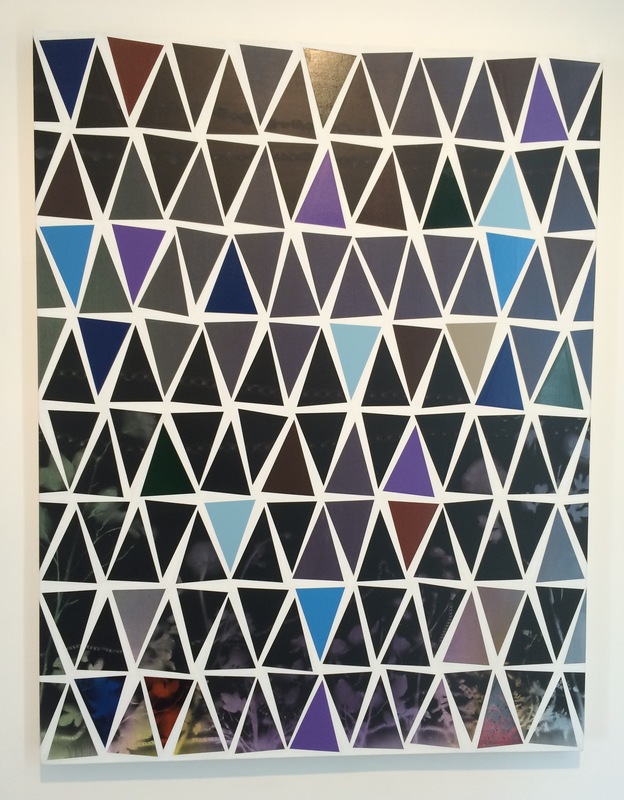 In this 2014 Untitled spray paint on canvas Higashionna uses an underlying grid of isosceles triangle. This tiling is composed of rows of isosceles triangles. Alternating the direction of each triangle, first base at the bottom, then the next rotated 180 degrees, so its base is at the top. Within each of these grid triangles there is a smaller spray painted isosceles triangle that is slightly twisted off-center. The outcome of these shifts is a bit disconcerting and jarring, giving the painting a pulsing sense of movement. The idea of an underlying grid or tiling pattern is still clear but by placing the hard-edge painted triangles at slightly disjointed angles Higashionna changes the entire feel of the painting.